These are a wonderful way for children to engage with their teachers and classmates, to develop their vocabulary and their confidence, to enhance their motor skills and to learn day-to-day skills such as tying shoe-laces, washing hands, packing their bags. Through storytelling and fun games and activities the children will learn letter sounds, numbers and counting, colours and shapes. They will learn to share and take turns, to abide by class rules and to ensure their own safety while playing e.g. no running in the class, sitting nicely in their chairs and playing carefully with toys, all of which will prepare them for when they start school. Learning a new language during the formative years has innumerable benefits. It helps children develop knowledge of other cultures, broadens their horizons and offers opportunities for the future. Research shows that a child’s ability to learn a new language is at the highest up to the age of 6. The natural curiosity of children maximizes their scope of learning and enables them to grasp various languages with ease. Exposure to multiple languages improves the neural activity of the brain, making children think in more than one language. When children learn other languages, they develop a life-long love towards communicating with others. English – There are a total of 11 classes in our English section. We base all of our activities and lessons on the Early Years Foundation Stage Framework. This centres on the belief that children learn best through play in an enriched and stimulating environment. Arabic – Each class has two Arabic lessons per week with a specialist teacher. They learn colours, shapes, numbers, songs and rhymes through Arabic. It isvery important for the children to learn about the culture and language in the UAE and gain an appreciation of the country in which they live. Art and Craft – This is a favourite with the children. It is a great opportunity for kids to develop their sensory skills. They play and experiment with various materials of different textures, colours and shapes. They learn to glue, cut, draw, fold and paint. Art and craft time can be organised or messy both of which the children love. They will develop creatively and enhance their fine motor skills through drawing, sticking and cutting. Music is one of the most essential elements in a child’s learning and development. It aids in promoting social interaction through interesting and engaging rhymes and songs that stimulate positive responses. In the infant stage, when a caregiver sings, the child immediately responds through eye-contact which is the first step towards socialization. Gradually the interaction develops into a duet, establishing a positive interchange of communication. In the toddler and pre-school stages, music continues to play an important role in encouraging cooperative group activities, creating a vibrant social behaviour. Studies and surveys show that music plays a vital role in improving retention capabilities. The inherent nature of music contributes to the emotional well-being of children through a calming effect on their minds. Besides the use of fun songs and rhymes during circle time and class activities the children enjoy one music session per week conducted by a qualified professional who uses various instruments as well as rhymes and songs making it a complete musical experience for the children. One of the major benefits of music is the development of physical coordination, which is enhanced through our dance lessons. Dance is a universal language where movement to music is enjoyable to children irrespective of culture or ethnicity. Ballet Dancing is an art form that fosters a positive self-image in children. It teaches children to be more expressive, improves body balance and helps develop their skill, poise, self-discipline and self-confidence. It benefits their creative, physical and social development. Presenting physical exercise in an enjoyable way has a positive effect in inculcating a sense of routine as children grow up. A professional dance instructor conducts weekly dance classes for the respective age groups and a room is specifically designed for these sessions. Dubai Drums – We have visitors from Dubai Drums every week. The children learn to express themselves through music by banging, tapping, dancing and drumming. They learn to focus using their eyes and ears and practice repeating different rhythms and beats. They revise rhymes and songs they have learnt in class helping to develop their vocabulary too! Children like learning when it involves hands-on activities and food; and cooking is an interesting way to engage them in learning basic skills such as shapes, colours, letters, numbers, spelling, reading, measuring, sorting, adding and subtracting. Cooking is an invaluable learning activity that aspires and nurtures critical thinking, imparts fundamental concepts essential for math and reading, improves fine motor skills, teaches science, promotes creativity and enhances emotional and social behaviour. When children are exposed to a variety of food by experiencing different colours, aromas and textures, their sensory perceptions are activated and will improve their intellectual senses significantly. Children also learn about different countries, climates, cultures and cuisines. At Kids Palace Nursery, there is a weekly cooking session led by the class teacher. Football – The children have one football lesson a week with a specialist who visits Kids Palace. This takes place in our outdoor gym area. The area is well shaded and spacious. It is a very good introduction to sports for some children. They learn about winning and losing. They improve their hand – eye coordination, their physical strength, confidence and most importantly they will develop a sense of camaraderie. Children are fascinated by puppets and interact strongly with them, which leads to an overcoming of shyness and fear. The imaginative capabilities of children are dramatically enhanced through hand-puppets. 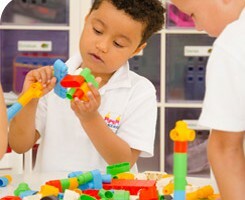 Children are extremely excited and get completely involved in the creative process. This activity nurtures children’s inherent ability to invent stories, visualize settings and develop interesting characters. The children participate in puppet play during their story time and indoor play sessions.